There's almost no better endorsement for a product than when the seller himself is an avid user. And Tim Bedell, the Calphalon King, is a prime example. "I have a passion for cooking," says Bedell, who operates cookware stores on eBay, Auctiva Commerce and ProStores. "My wife and I love to cook together, so we spend a lot of time in the kitchen." His favorite medium, he admits, is the outdoor grill. "I'm a typical male; grilling is what we do," he laughs. But when it comes to cooking and baking, he's all about Calphalon. Like many online merchants, Bedell's e-commerce journey began a few years ago with selling miscellaneous personal items on eBay. As he ventured out to estate and yard sales to expand his offerings, he discovered he had a knack for finding things that would make a good profit on eBay. "One day, about a year ago, I stumbled on an estate sale where there was a garage full of pots and pans," recalls Bedell. "There were tons and tons of All Clad, Calphalon and various brands. So I bought all of it." The cookware sold very well. And he had a great time selling it. 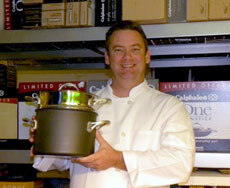 That gave Bedell the idea to specialize in professional grade cookware. "My wife suggested I get in touch with Calphalon. I didn't think they'd want to deal with me. But I went to the Calphalon Kitchen store, and got to know the manager, who is now the district manager, and now he sells to me. It's mostly overstock and liquidation stuff," he explains. "I'm thankful my wife pushed me in that direction, because I wasn't even going to go that way." With a new focus on cookware, Bedell decided to rebrand himself, and retired his former eBay moniker, Longhair Inc.—a vestige of the days when he sported a 2-foot ponytail. "I thought to myself, 'hair and cooking do not go very well together,'" he laughs. "So I changed my username to Calscookware. 'Cal' is the name I gave the chef in my logo." It wasn't long before sales in his eBay Store, Cal One King, went through the roof. "I'm selling about $5,000 a month so far and about 90 percent of that is eBay," he says. "During the summer, sales sort of dried up, but now they're astronomically good." His best seller: an 8-inch egg pan. "Everybody loves the little fry pans," he remarks. It was about a year ago, while first settling into his newfound niche, that Bedell started using Auctiva's eBay listing tools. "They're awesome tools," he says. "I use pretty much everything Auctiva has to offer." Bedell most appreciates the features that make listing items more convenient and save him time—which, working as a photographer for another eBay PowerSeller, he doesn't have a lot of. "I like the profiles a lot because my products never change. So I can create profiles for the same listing and send it to eBay or relist it," he explains. "My pictures don't change, either, and Auctiva lets me save all of them. It's just nice to not to have to type in all of that stuff all over again." Through Auctiva, Bedell learned about Auctiva Commerce. Excited to have an alternative to eBay, he opened Calphalon King's Cookware in April. His sales on the site have since grown to as much as $1,000 a month. "It's very user-friendly," he says of the Auctiva Commerce software. "In fact, my sister-in-law was looking for a Web host. I recommended Auctiva Commerce, and she signed up. She's been fairly successful." In October, Bedell also opened a ProStore, Calphalon One King, because he wants to have multiple channels for customers to find him. "The more names you have out there, the more chances you're going to have to sell," he says. Between working outside the home and maintaining three online stores, Bedell doesn't have much time for social-media marketing, but he does maintain accounts on Facebook, Twitter and Merchant Circle to make his name more searchable. But Google Base has given him the biggest bang for no bucks. Stat counters on each of his sites indicate that 60 percent of his traffic is from organic searches. Bedell is so pleased with how quickly his business has grown that he's looking to expand his product line to other high-end cookware brands. "Who knows, I may even open another Web site and put my wife to work on it," he laughs. "I don't know if there's any secret to [my success], but I don't want to call it luck, either," he adds. "I just keep plugging away and don't give up. There's a saying that a good entrepreneur always starts it, but he never finishes it. Well, I've started this and I'm just going to keep going with it. "I'm stretched thin like Gumby. It's late nights until 1 a.m. or 2 a.m., and up early in the morning and off to work again," he says. "But that's what business is all about. And what's better to do than what you love?"